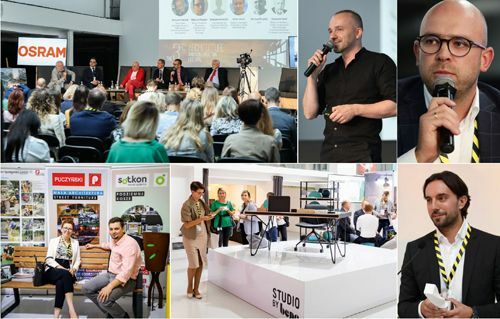 The meeting took place on September 19th in the inspiring setting of the Pin Up Studio – which operates from a converted industrial building in Warsaw. Those taking part could learn from the in-depth knowledge shared during the presentations and discussion panels hosted by experts in their fields, as well as take part in the workshops or visit the various stands and exhibitions. The meeting began with a presentation by distinguished Austrian product designer Thomas Feichtner on the latest trends in office furniture design. “The boundaries between working in the office and at home, which were clearly delineated for our parents’ generation, have now blurred considerably. This phenomenon has led to a change in the approach to interior design and office furniture,” he declared during his speech. “We have some excellent construction traditions that we can draw on, but we should be using modern technology to do this,” argued another speaker, Bogusław Barnaś of BXB Studio, during his talk on sustainable architecture that is at the same time rooted in tradition. The discussion panels that followed aroused a great deal of emotion. The first of these, moderated by Grzegorz Buczek, was devoted to advertising in urban space. “Advertising is, and has always been, an element of the city. It has always had a city-defining character too – just think about what Piccadilly Circus in London or the whole of Las Vegas would be like without neon hoardings,” argued Sławomir Gzell of the faculty of architecture of the Warsaw University of Technology. “Of course, advertising on such a scale would be considered grossly over-the-top in any Polish city and would certainly generate opposition. Saturation with large format advertising disturbs the harmony of the city, but harmony is understood differently in each place,” he added. The discussion remained heated during the next panel on the city-forming role of real estate, which was moderated by Krzysztof Sołoducha. “In war-devastated Europe, it was necessary to build quickly and on a large scale, so the design traditions that had prevailed for centuries were abandoned in many parts of the continent,” pointed out architect and urban planner Tomasz Konior of Konior Studio. “As a result, we no longer have compact living urban spaces but disparate complexes of buildings that you need to travel to and from by car. It can sometimes resemble a dismembered human body that obviously can’t function in any way,” he lamented. After lunch it was time for more presentations: Rafał Gawrylak of Es-System detailed the latest technology related to lighting, mostly office lighting; while Henrik Lund Nielsen of 3D Printhuset, the designer of the first house in Europe to be created on a 3D printer, spoke about the history and future of this technology. A related topic, experimental construction, dominated another panel discussion, this time moderated by Tomasz Daniecki of GVA Poland. 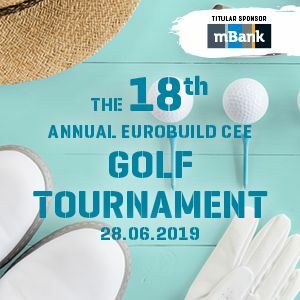 “It’s interesting that much of the latest technology used in building is somewhat familiar: wooden construction, modules and prefabricated elements – we have already done all this, although in a different way, of course. Now these building methods are making a comeback in a significantly improved form,” claimed Szymon Wojciechowski, co-owner of the APA Wojciechowski studio. “However, I am fascinated – and at the same time disturbed – by some ‘space-age’ tech, such as artificial intelligence and big data, which are increasingly entering the world of real estate, even including smaller-scale real estate,” he added. The final discussion in the conference section, moderated by Anna Górska-Kwiatkowska, concerned trends in the design of co-working, kitchen and rest areas. “Office design is becoming increasingly similar to apartment planning: the designer takes into account the needs of the members of its family, i.e. all the building’s users. This is a huge change compared to the way this was done until very recently, when it was the management of the company that decided on the layout of the interiors,” noted Anna Marszałek, an interior designer at Nowy Styl Group. Along with the presentations, the event also featured a number of workshops. In small groups it was possible for people to learn more about BIM from Robert Szczepaniak, who specialises in this field, to learn about how to save electricity in the office with Maciej Kreft of Osram, to gain an insight into the secrets of urban beekeeping as explained by Kamil Baj of Pszczelarium, and to design your own collection of ceramic tiles (with the help of Marta Rybicka of Ceramika Paradyż).